View Bunyip River Basin in a larger map (opens new window). A small, narrow, snaggy, mud-bottom creek flowing through open grazing country. Carries small brown trout av. 220 g, small river blackfish and short-finned eel as well as shorthead lamprey, trout galaxias, common galaxias and southern pygmy perch. 16 ha. Parkland & picnicking with all facilities. Boating not permitted. Melway Ref: 126 D 4. An artificial lake formed at the northern end of Cardinia Reservoir to prevent local urban run-off water from reaching the main storage. Access from the Selby-Aura Road. Contains small redfin, river blackfish and short-finned eel. Several attempts have been made to establish a trout fishery but water quality has not been suitable for their survival. A small creek rising near Mt Eliza and flowing for 40 km to enter Port Phillip Bay near Mt Martha. It has a reliable flow and a stable channel 3-7 m wide. Pool depth varies from 50 cm upstream to 100 cm downstream. Sand substrate. Although it flows through largely cleared farmland, there is dense riparian habitat and good quality fish habitat. The overflow from Devilbend Reservoir enters via Devilbend Creek. Contains short-finned eel, common galaxias, trout galaxias, flathead gudgeon, eastern gambusia, eastern dwarf galaxias and southern pygmy perch. 3 ha. Picnic facilities, good access to wheel chair standard. Melway Ref: 130 J 4. An open and relatively exposed water located in a residential area surrounded by parkland. Previously included in the Family Fishing Lakes Program. The entire shoreline is suitable for fishing. Stocked annually with rainbow trout. A popular water providing good fishing in the winter and spring. Rock-ramp fishways have been installed at the following barriers: 11 Mile Road, Ellis Road, Evans Road, Iona, Koo-Wee-Rup, Tonimbuk Gauge and Vervale. This has opened up 200 km of water to migratory species. Rises in forested hills and flows south to the Princes Highway at Longwarry North. In the upper reaches it is 3-5 m wide, with pools 70-130 cm deep and riffles 30-50 cm deep. The bottom is fine gravel with light woody habitat and provides good trout habitat. Approximately 8 km above the Highway the land becomes flatter and has been cleared for farming. The bottom is all sand through this section. There is reasonable road access along gravel roads to a Melbourne Water diversion weir in the upper reaches. There is no road access above the weir. The upper reaches contain mainly brown trout and rainbow trout to 200 g with brown trout and river blackfish in the middle reaches. Congoli and short-finned eel are also found closer to the Princes Highway. Other species present are pouch lamprey, shorthead lamprey, common galaxias, mountain galaxias, Australian grayling, southern pygmy perch and goldfish. A number of rock ramp fishways have recently been constructed to assist natural fish migration in the river. The river has been formed into a drainage channel known as the Main Drain. It is 10-12 m wide with little instream fish cover. Water depth in summer varies from 35-100 cm, the substrate is smooth sand and the water is turbid. There is almost no riparian vegetation except for some clumps of rushes along the banks. This is poor fish habitat carrying a few brown trout av. 400-500 g.
A small narrow creek with some brown trout to 300 g (av. 200 g) near its junction with the Bunyip River. Also carries river blackfish, short-finned eel, some redfin, eastern gambusia, southern pygmy perch and eastern dwarf galaxias. This is a small, narrow, deep creek flowing from timbered hills to flat open farmland. Gravel in the upper reaches and sand downstream. Carries mainly brown trout av. 350 g with some river blackfish, rainbow trout, short-finned and long-finned eel, shorthead lamprey, climbing galaxias, dwarf galaxias, trout galaxias, Australian grayling, congoli, eastern gambusia and goldfish. The creek flows through flat open country and often becomes dry in summer. Some brown trout to 700 g are taken during periods of good water flow. River Health Program works include erosion control, removal of willows and revegetation, and the installation of sediment traps. A Melbourne Water domestic water storage which is not open to angling. Family Fishing Lake, good facilities. Melway Ref: 134 E 7. Set in parklands in a major sporting complex SE of Cranbourne and accessible off the Berwick Cranbourne Road. Good access and facilities. Managed as a Family Fishing Lake and subject to stocking with advanced yearling rainbow trout (See Introduction). Rises in open farmland then flows through residential areas. It is a small stream with a highly modified channel and catchment. Water flow and level fluctuate wildly and the water is often turbid and polluted. European carp to 5 kg, redfin to 1.5 kg, and short-finned eels provide some fishing. Other fish are shorthead lamprey, pouch lamprey, common galaxias, climbing galaxias, congoli, bluespot goby, Yarra pygmy perch, trout galaxias, eastern dwarf galaxias, southern pygmy perch, and oriental weatherloach. A small, narrow, muddy stream running through flat open farming country. Carries a few small brown trout and river blackfish. Erosion and weed control and revegetation are carried out as part of the River Health Program. The Devilbend Reservoir was decommissioned in 2000 following a decision by Melbourne Water to increase capacity and improve water quality to the Mornington Peninsula by building a pipeline from Cardinia Reservoir to Pearcedale. Parks Victoria released a draft management plan for Devilbend Natural Features Reserve in early 2009. The draft plan was released on the Parks Victoria website for public comment. It contained the proposed vision for the reserve, and management directions and strategies to implement the vision. The final Management Plan is currently being prepared. A fast-flowing, shallow, overgrown stream flowing though timbered hilly country, sand and gravel bottom. Contains mainly river blackfish average 100 g, short-finned eel, some brown trout to 200 g, as well as common galaxias, mountain galaxias, eastern dwarf galaxias, shorthead lamprey and southern pygmy perch. Family Fishing Lake, toilets and picnic facilities. Melway Ref: 78 E7. A deep lake formed in an old quarry set in parklands off Warrigal Road, with good facilities and access. Managed by Parks Victoria. The lake is fitted with an aerator, and rainbow trout up to 2 kg have been taken. Managed as a Family Fishing Lake and subject to stocking with advanced yearling rainbow trout (See Introduction). 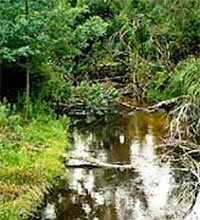 Narrow (1.5 m wide) creek originating in steep forest. Sand substrate and pools to 30 cm deep. In the middle and lower reaches, flows through flat farmland to the Tarago River. Here, it is up to 4 m wide but is mostly shallow water with riffles 12-35 cm deep and pools to 70 cm. Dense riparian vegetation consists of tea tree, rushes and blackberry. Sand substrate, but instream habitat is good. Contains mainly brown trout to 350 g, (av. 90 g), with river blackfish (av. 90 g), short-finned eels and southern pygmy perch. Rises in open, moderately hilly country as a shallow stream with a gravel bed. Becomes progressively wider (6 m) with extensive deep pools (200+ cm) as it flows towards Heath Hill. The catchment is highly modified, the stream is channelised in some areas and the water is generally turbid. Attempts have been made in recent years to stabilise the system and restore habitat values by erosion control, willow removal and replanting with native species. Carries mainly brown trout av. 220 g, (max. 1 kg), with some river blackfish to 500 g, rainbow trout, short-finned eel, redfin, pouch lamprey, shorthead lamprey, Australian grayling, congoli, common galaxias, climbing galaxias, Australian smelt, goldfish and Gippsland spiny crayfish. Not stocked with trout since 2001. Below Heath Hill, the river has been straightened and partly channelised with steep banks and a mud bottom. Contains mainly small brown trout with a few larger fish to 700 g taken in early summer when the water clears. There are also short-finned and long-finned eel, congoli and occasional Australian grayling. Access is limited due to private property. A former domestic water storage, now part of the Lysterfield State Park and managed by Parks Victoria. Open to most forms of recreation but the shoreline is considered too fragile to permit fishing. A small creek flowing through moderately sloping farmland. Upper reaches 2-3 m wide, with shallow riffles (15 cm) and occasional pools to 70 cm, clay substrate. Width increases to 4 m wide in the lower reaches with pools over 100 cm, but there are extensive areas of shallow water with sand substrate. Riparian vegetation is good particularly where it flows alongside the Point Nepean National Park and near Boneo Road. Accessible only at road crossings or from walking tracks in the National Park. Contains a small self-sustaining population of brown trout to 600 g, as well as short-finned eel, common galaxias, trout galaxias, climbing galaxias, river blackfish, congoli and southern pygmy perch. Good fish habitat but not a popular angling water. The larger and lower of two retarding basins on the Monbulk Creek. Stocked in the past with brown trout but did not produce a fishery. Contains small roach, redfin, some short-finned eel and occasional river blackfish. A highly modified water which only provides a fishery downstream from the Wells Road Bridge. In this area, it has been opened up to provide boating access to Port Phillip Bay and contains black bream, yellow eye mullet, small Australian salmon, short-finned eel, flounder and occasionally mulloway. A popular bank fishing area with good access. Family Fishing Lake, off-road parking and play equipment but no other facilities. Melway Ref: 72 K12. Three lakes set in a reserve in a residential area near the junction of Stud and Kelletts Roads. The upper two of these, Lake Hill (1 ha) and Lake Sutton (2.5 ha), are managed as Family Fishing Lakes and stocked with advanced yearling rainbow trout (See Introduction). Access to the shoreline is somewhat restricted by property boundaries and reed growth but the area attracts considerable fishing pressure. Contains roach to 400 g, redfin to 1 kg, European carp to 6 kg and rainbow trout. Popular fishing baits for roach and are worms, corn and bread; and worms and live bait for redfin. A domestic water storage closed to fishing. 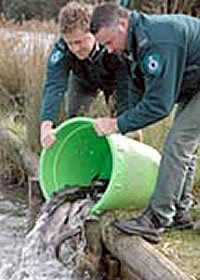 Contains brown trout, which spawn in the upper Tarago River, and river blackfish. Flows through steep forest with good access hindered only by steep banks and dense blackberry growth in some areas. The water is mainly shallow (less than 50 cm) with small pools to 100 cm deep. The bottom is sand, with gravel in some of the riffles. A natural forest area suitable for wading and fly-fishing. Contains mostly brown trout, av. 150 g, (max. 1 kg), a few river blackfish and some rainbow trout, along with trout galaxias, climbing galaxias, mountain galaxias, and southern pygmy perch. Larger trout to 2.5 kg enter the river from the reservoir during the winter and spring. The river flows through open hilly country and is wider (8-10 m) and has low banks and good riparian vegetation. An Environmental Water Reserve has been identified and an additional 3,000 ML/annum has been allocated to that reach. The riffles are generally 30-50 cm deep with significant areas of deeper water to 100 cm and pools to 140 cm. Suited more to bank fishing than wading. Access is good. Excellent habitat for larger fish. Contains brown trout to 1 kg, some large river blackfish to 2 kg, European carp, short-finned eel, southern pygmy perch, congoli, common galaxias, Australian grayling and goldfish. Popular fishing water suitable for wet fly fishing or baits such as worms drifted downstream. A small stream with turbid water and badly silted in places. Access is restricted by private property. Contains common galaxias, southern pygmy perch and short-finned eels.